Anba Mikhail (Arabic: نيافة الأنبا ميخائيل مطران أسيوط‎) (4 July 1921 - 23 November 2014), was the Elder Metropolitan of the Holy Metropolis of Asyut (Lycopolis), (Hieracon, (Hierakonopolis) and (Apollonopolis Parva) of the Coptic Orthodox Church of Alexandria and was the Abbot of the Monastery of Saint Macarius the Great, in Scetes, Lower Egypt until early 2009, when he decided to resign this responsibility due to his failing health and also due to the demise of Matta El-Meskeen, the Chief Hegumen in-charge of the Monastery of Saint Macarius the Great in 2008. Metropolitan Mikhail was born in 1921, in the poor family of Egyptian Coptic Christians in the village of "Al-Rahmaniya", in the district of "Nag Hammadi" in "Qena" Governorate. 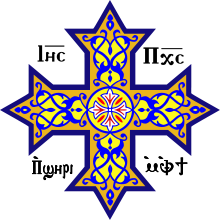 He became a monk of the Coptic Orthodox Church of Alexandria on 19 February 1939. He was ordained priest on 17 November 1939. He has served as Coptic Orthodox Metropolitan of Asyut since 1946. His episcopal ordination took place on 25 August 1946. For many years, he was the most senior Oriental Orthodox bishop in the date of episcopal ordination in the world. He died on 23 November 2014 in Asyut, Egypt. ^ "Welcome anbawissa.org - Hostmonster.com". www.anbawissa.org. Retrieved 2018-03-14. ^ "Иерархия церквей | Древние Восточные церкви". www.hierarchy.religare.ru. Retrieved 2018-03-17.